Cedar Springs Community Players presents Alice In Wonderland, Jr.
Posted on 17 August 2018. 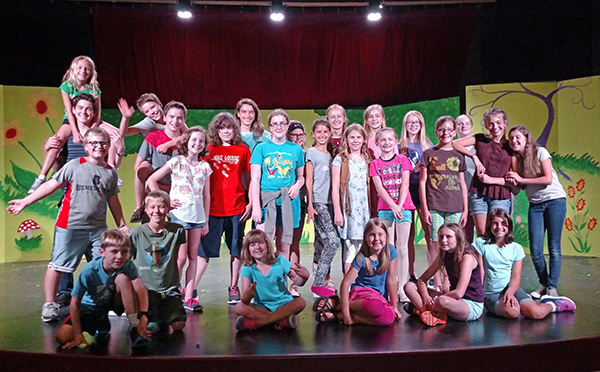 Tags: Alice in Wonderland Jr.
Alice and her madcap friends are coming to the Kent Theatre on August 18, 19 and 20. Join them as they travel down the rabbit hole and experience their adventures in Wonderland. “That depends a good deal on where you want to get to,” replies the Cat. “So long as I get somewhere,” Alice states. The young actors in this production include Natalie Schneider as Alice and Kateri Schneider as Small Alice. Grace Berlin, Emily Ranschaert and Lauren David play Cheshire Cats. Heidi Ranschaert plays Mathilda; Ava Koester, the White Rabbit; Thomas Prina, the Doorknob; and Sienna Koester, the Dodo Bird. Tweddle Dum and Tweddle Dee are played by Carol Olvera and Maggie Prina. Eli Koester plays the Caterpillar; Willow Didlauskas the Mad Hatter; and Maddison Jenema the March Hare. Lydia Olivera is joined by Ben Flickinger as Queen and King of Hearts. The beautiful singing flowers are played by Sage Sidlauskas, Anna Olvera, Chloe Kerrish, Avery Jennings and Lydia Morey. The chorus is made up of Lilly Scott, Elizabeth Jahns, Jesse Ranschaert, Monica Cole, Hannah Cole, Jordyn Kerrish, Lilly Wood, Olivia Wilbur and Jacob Ziolksowski. Technical Assistants are Violet Sidluakas, Alyssa Cole, Oliva Cole. Art Director and Prop Master are Heidi Ranschaert and Nolan Patin. Lighting Designer is Zach Koester. The play is directed by Lori Koester with her children, Ava and Eli serving as assistant directors, choreographer and music director. Show times are August 17 and 18 at 7:00 p.m. and August 19, 2018 at 2:00 p.m. Tickets are $12 for adult and $5.00 for 18 years and younger. Tickets may be purchased at the Kent Theatre. For information on becoming a part of the Cedar Springs Community Players, please visit our Facebook Page or our website at cedarspringscommunityplayers.org. Upcoming auditions for the Players’ October performance of “Arsenic and Old Lace” will be held at the Cedar Springs United Methodist Church August 22 and 23, 2018 from 6:30 to 8:00 p.m. Cast includes 3 women and 11 men, several of which are minor roles providing an opportunity for aspiring actors to try out and experience community theatre. Technical positions are also available. Performances for “Arsenic and Old Lace” will be October 18, 19 and 20, 2018.